This winter I’ve lived in black, grays, and other atramentous hues. With spring approaching, it’s time to emerge from hibernation and shed our winter coats. 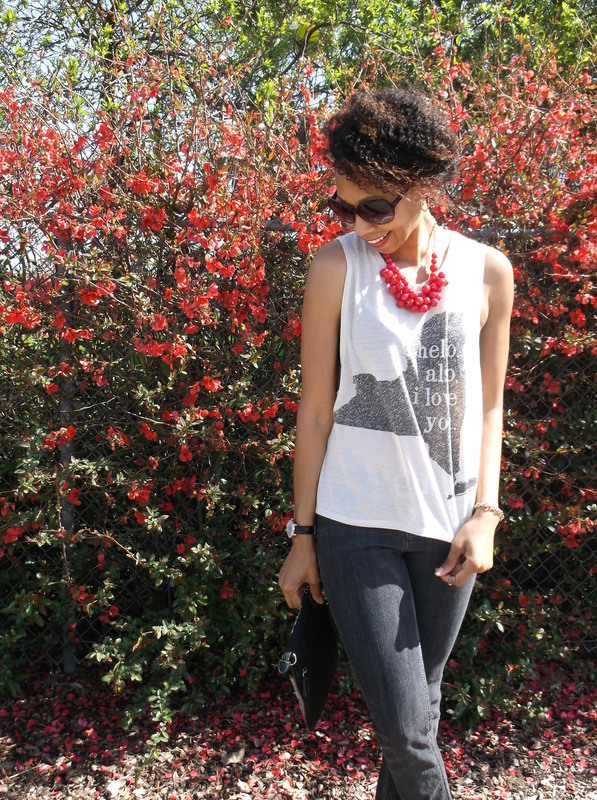 I can’t think of a better way to do so than by adding a pop red to today’s grayscale ensemble. I was searching for red pumps last month when I scored these patent leather Mary Janes. If you haven’t noticed from other posts, I am a sucker for Mary Janes. LOL. And these beauties are no exception. I’m wearing the 4.5 inch heels with a cream graphic muscle tee. I love the sweet message printed on this top! Red is the perfect complement to the loving words. So in addition to the heels, I’m wearing my red grape cluster necklace. Stone washed black skinnies and a multicolored clutch finish the outfit. How will you use red this spring? Clutch: A street vendor in Brooklyn, NY. Thank you, doll! I stopped by your blog. It’s wonderful! xo! Fantastic outfit I love the cuffed jeans and the accents of red! Girl! How fabulous is your style!!! 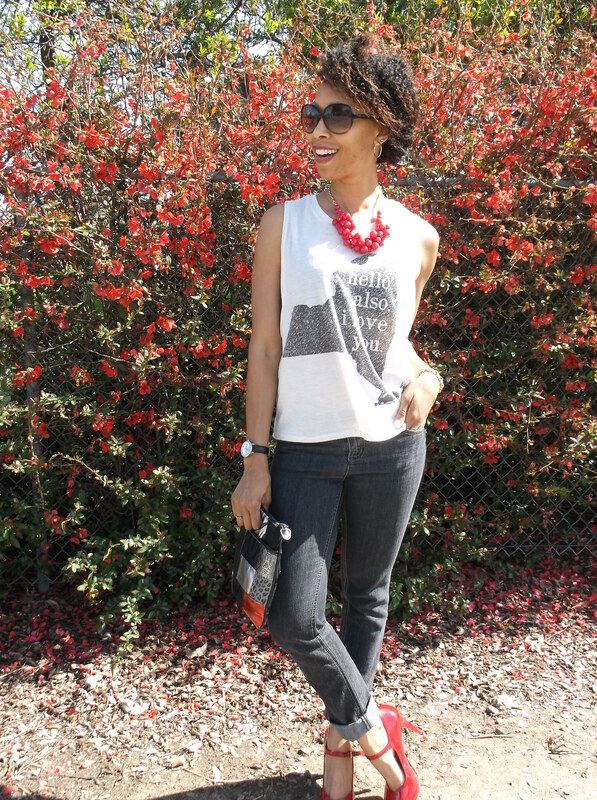 Seriously loving how you styled your shoes and your necklace! I’m so glad I found your blog. Would you like to check out my blog and perhaps we can follow each other on GFC or anywhere else and keep in touch? Hey HaeMin! Thanks for stopping by! I’ll definitely check your site out! xo! Love the pops of red in this look!! HOW GORGEOUS ARE THOSE RED PUMPS!? I’m a sucker for pops of color in my shoes and I just love how much your pumps elevate this look and make it so elegant YET edgy! Brilliant! Thank you, sweet pea! Good eye to notice the NY top! xo!